On Mac the plug-ins are available as drive images. After download, double click on the file to open it. You can then drag and drop the file(s) to the shortcut that is provided within the image. It will install the software for all users on the machine. In case you do not have admin rights on your Mac or if you want to install the software to another directory, just copy the files to the appropriate location. If required, more information is available in the README.txt file that is included in the package. When a new version of the software is released, open the new image and copy the files over the previous ones. The new version will replace the older one. To uninstall the software, simply remove the component(s) from the folder where you have copied them during install (move them to the trash). The spectrum view where you can see the	spectrum of the curves shared by all the instances of the plug-in. The Diff pane when you can compare several spectra by visualizing their difference. The routing pane where you can choose which analysis curve you want to display and share with other plug-in instances. Show/Hide the controls pane (A): The controls pane can be collapsed to gain real estate on the screen. This changes the size of the user interface of the plug-in. Some host applications may require you to close and reopen the user interface of the plug-in to take this update into account. Choose between spectrum and difference panes (to be displayed in (B)). Choose the display mode (single or dual screen, and row or column). In dual screen mode, you can show both the spectrum and the diff panes at the same time. Select the screen size (small, medium or large). Show the routing matrix to select and rename the curves routed from this instance of the plug-in. Synchronize all instances. This is particularly useful when using the difference view: you may need to synchronize the multiple instances of the plug-in so that they compute the spectrum at the exact same time, to improve the accuracy of the difference computation. You can freeze all curves (for all instances) in order to get a snapshot of all the curves. Reset the average or peak curves for all instances. Filled: show filled curves. This option may become CPU-heavy when you have multiple curves to display with a large screen setting. Antialias: antialiased curves look better (smoother), but you may want to disable this option if you prefer "old style" display. Name: display the name of the curve on the graph (overlay). Show List: display the list of available curves at the right of the current pane. These two sliders let you control the x and y zoom for the graphs in both views. Once zoomed, you	can drag the rulers with the mouse (click on the vertical or horizontal ruler when the cursor is a small hand and drag to move in the graph). It is also possible to zoom the screen by selecting an area with the mouse. You can then right click on the graph to unzoom. At any time, right click on the graph to unzoom. (A) The controls displayed at the bottom of the user interface let you modify the parameters for the audio analysis of the current instance or all other instances at the same time. (B) Current display (spectrum or diff pane). (C) This is the place where the coordinates of the mouse cursor are displayed when the mouse is over a graph. In order to route curves to the display and share them among instances, you need to open the routing pane (by clicking on the “Routing” button). It is displayed by default when you first open the plug-in. List of available curves for the current instance. These are the curves you can route to a shared curve numbered from 1 to 16. 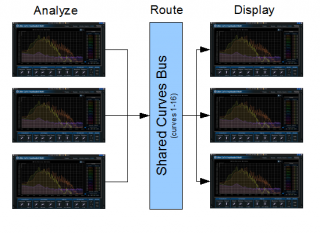 The plugin proposes three types of analysis curves for each of its four channels. The four channels are the left and right (or mid and side, depending on the “Mid/Side” setting), and the combination of these channels (max or average). The instant spectrum is the real time view of the frequency content, the peak is the maximum of the spectrum and average is the average of the spectrum over time. This last type of analysis is particularly interesting when comparing tracks for EQ matching. Select a shared curve slot to display and share the curve corresponding to the row. When a slot is not available it means that it is already in use by this instance or another instance. You can click on the 'X' button to free the slot occupied by the curve corresponding to the row. Use this button to reset all curves affectations for this instance of the plugin. You can close the routing pane by clicking on the little cross at the top right, or by clicking anywhere in the background behind. Select the shared curves to display. 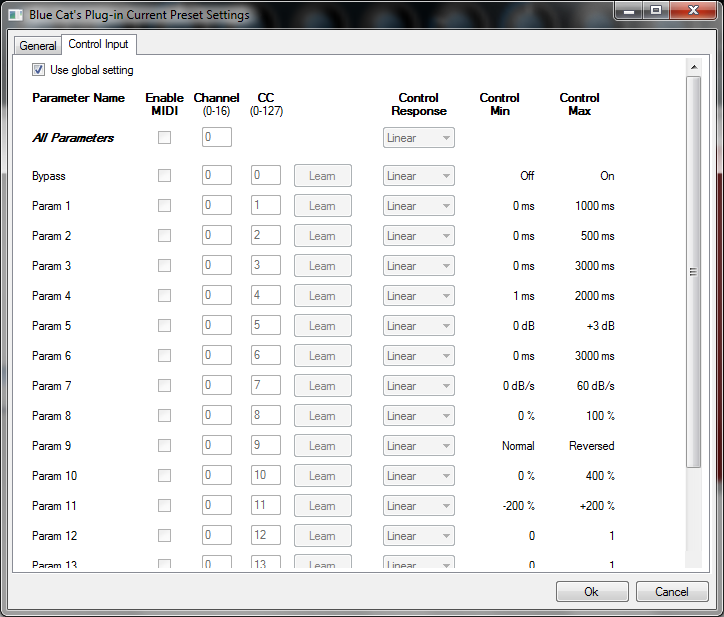 No curve will be shown on this view until you select the curves you want to share in the routing pane. 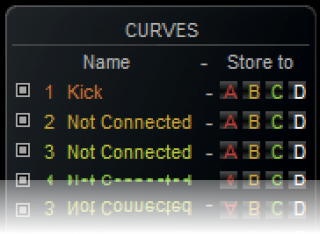 The curve names can be customized (see the routing pane). The four “A B C D” buttons let you store the curve to one of the proposed memory slots. The curves stored into these slots can be shown/hidden with the buttons available in (4). Show/Hide curves stored in memory. Both the frequency/gain pair representing the coordinates of the mouse cursor and the note information are displayed when the mouse is hovering over the graph. The note information shows the name (A, B, C...), the octave (A0, A1,...) as well as the number of cents below or above the note. This slider lets you change the absolute threshold for the current instance (see the parameters section). This view shows differences between selected spectra. It is very handy to compare several spectra. For example you can compare the left and right channels of a single track to check the its spectral balance (repartition of frequencies across the left and right channels), or you can have an instance compute the average spectrum of a reference commercial track and compute its difference with the average spectrum of your current mix. The resulting difference curve will show you the EQ you need to apply to your track so that your mix “sounds like” your commercial reference, as far as spectrum is concerned. Select first spectrum for the difference. Select second spectrum for the difference. Store the difference to one of the memory slots. Show/hide curves stored in memory slots. The resulting curve shows the difference between the first and the second curves. This means that when the difference curve is above 0, the first curve is greater than the second. For a more accurate visualization it is recommended to compare curves that have similar precision settings. When comparing different tracks you will usually not be interested in absolute values but in the shape of the curve: both tracks may have a different absolute level. The settings described in the parameters section are available at the bottom of the user interface. The absolute threshold can also be controlled by the vertical slider on the right of the display. 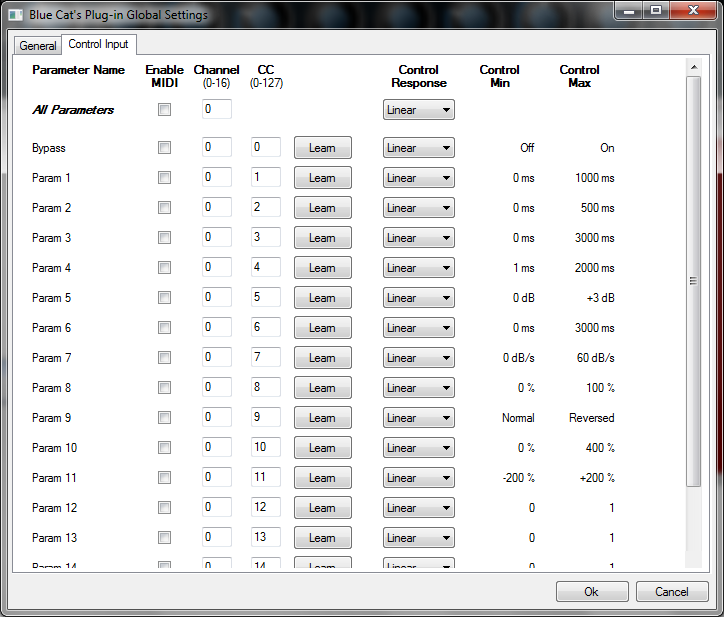 Apart from the reset buttons, all these parameters control the analysis for the current instance of the plug-in only. To modify the settings for other instances, you can either push the values used in the current instance to all others, or open the user interface of each other instances you want to modify. It is possible to push the value for each parameter to other instances of the plug-in independently (using the small red arrow close to the control) or to push all the settings of the current instance to all others with the large blue arrow on the left of the controls pane. This lets you make multiple measurements and reuse them elsewhere as references. For each instance, open the routing pane and select the curves you want to see and share. 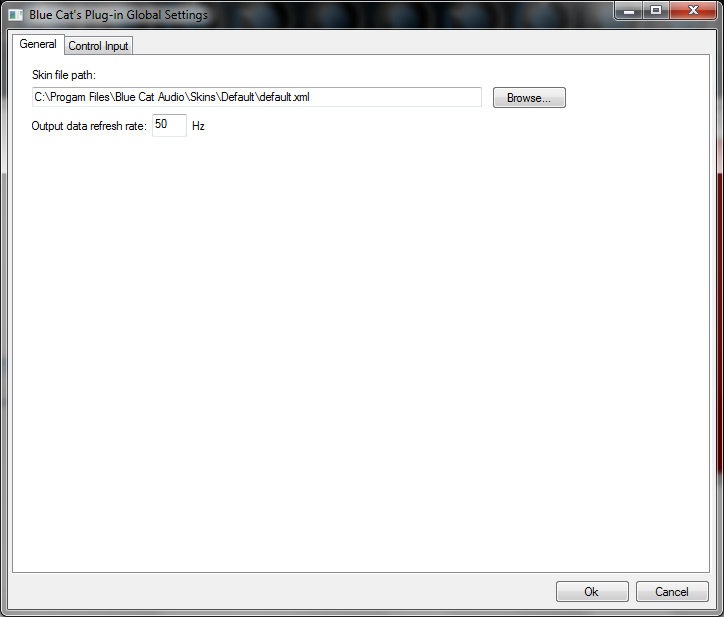 Adjust the settings for the audio analysis in each instance. Open the user interface of an instance of the plugin and select the shared curves you want to see. Checking overlapping frequencies when mixing: when doing your mix it might be difficult to hear overlapping frequencies across tracks and a bit of visual help can be handy, especially if your monitoring environment is not ideal. In this case the FreqAnalyst Multi can be of great help: instantiate the plugin on the tracks you want to check and look at the spectra on the main spectrum view. 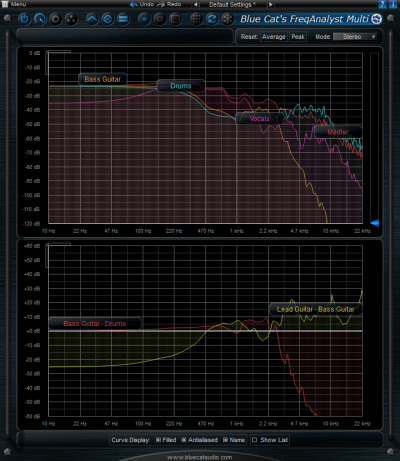 Overlapping frequencies can be easily detected on the graph (zoom in if necessary) and corrected with a little bit of EQ. Comparing your mix with a commercial reference (EQ matching): sometimes you want to approach the sound of song you like or a precise style. In order to obtain a similar spectrum, import your favorite track in your host application, instantiate the FreqAnalyst Multi on this track and on the track for your own mix. Route the average curves for both tracks and compare them in the diff view. The resulting curve shows you the EQ you need to apply to your mix to obtain the same average spectrum, the “sound signature” of this track. Measuring an effect chain: it's sometimes good to know what is exactly happening to your audio signal while applying audio effects, to detect defects or imply understand what it does. 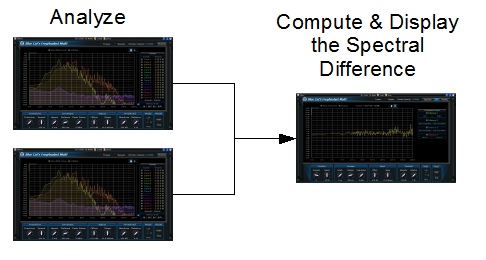 By measuring the spectrum before and after an effect is applied to a track and compute the difference, you can exactly reproduce the dynamic frequency response of the effects. It's also a good way to measure the frequency response of a room, a monitoring system or any gear you may have. Spectral balance measurement: measuring the left and right channels of an audio track and displaying the difference between these curves in the diff view will let you see the balance of each frequency bin. This can be useful to check how balanced you mix is or on the contrary to see left/right differences that might be required for stereo widening. In the latter case, using the mid/side channels and their difference might be even more appropriate. For more information about how to use this plugin in your favorite host application and for more practical usage examples, have a look at the Blue Cat's FreqAnalyst Multi Tutorials. 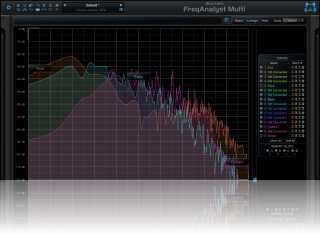 Like all Blue Cat Audio plug-ins, Blue Cat's FreqAnalyst Multi uses a skinnable user interface. It means that the appearance and behavior of the user interface can be entirely customized. Smooth Bypass: smoothly bypass the plug-in (just like a power button). Window Opacity: reduce the opacity value by turning the knob, and make the plug-in window transparent. (the result may depend on the host application). Show/Hide MIDI and Automation Control Settings: show/hide the buttons that give access to direct MIDI/Automation setup for each parameter in the user interface. 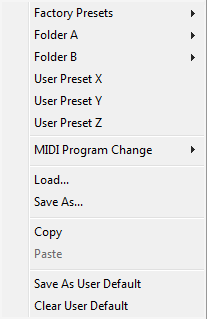 This button will show or hide dropdown menu buttons that popup a MIDI/Automation setup menu described here. 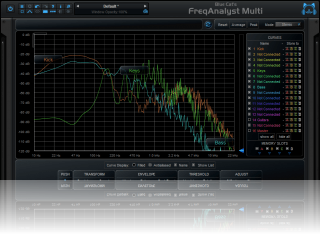 Blue Cat's FreqAnalyst Multi can also be remotely controlled via MIDI using MIDI CC ("Control Change") messages or automation curves, if your host application supports it. It is possible to customize the channel, control numbers, range and response curve used for each parameter in the settings panel available from the main menu (see the Plug-in Settings chapter for more details). The input parameters of this plug-in are described below. They affect the spectrum analysis for the current instance of the plug-in. Each instance has independent parameters for the audio analysis. Rate of the audio to frequencies transform. The higher this value, the better time resolution (and perceived smoothness). Beware that above 100% CPU consumption might increase, especially when the precision is high. Attack time for the frequencies envelope follower. Release time for the frequencies envelope follower. Rate of the peak curve reset. If set to 0, the peaks will never decrease and will represent the maximum value. Offset added to the frequency response curve. Can be used to correct the response curve. Stereo operation mode for the plug-in: stereo (left/right), mono or mid/side. 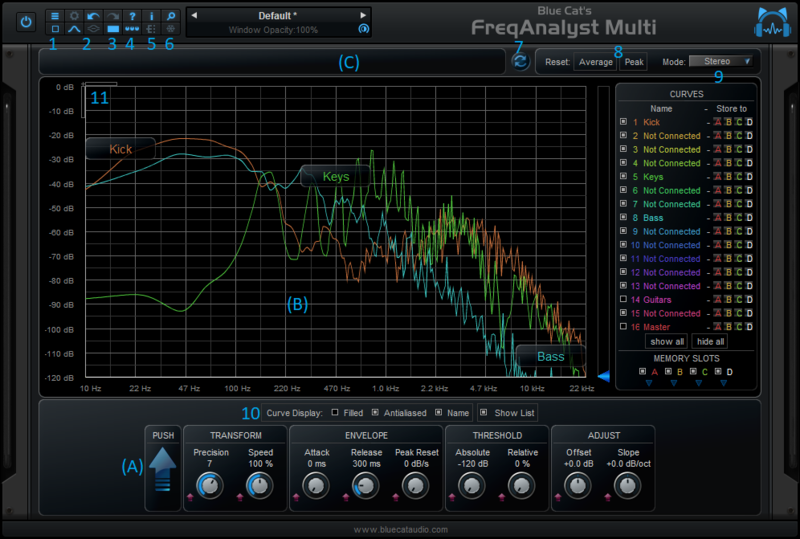 The FreqAnalyst Multi plug-in provides visual feedback about the frequency content of the audio signal thanks to output curves that can be routed to one of the 16 display curves. The plugin provides two channels. In stereo mode, channel 1 is left and channel 2 is right. In Mono mode, channel 1 is mono and channel 2 is fed with silence. In Mid / Side mode channel 1 represents the mid channel (mono part of the signal) and channel 2 the side channel (stereo part of the signal). Instant frequency content for channel 1. Maximum value of the frequency content for channel 1 over time. Average value of the frequency content for channel 1 over time. Instant frequency content for channel 2. Maximum value of the frequency content for channel 2 over time. 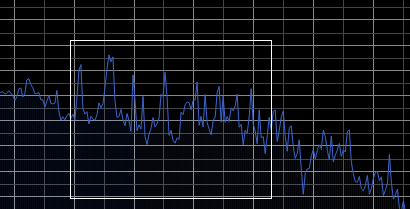 Average value of the frequency content for channel 2 over time. Instant frequency content (channels average). Maximum value of the frequency content (channels average) over time. Average value of the frequency content (channels average) over time. 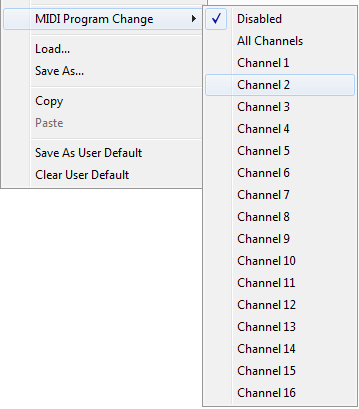 Instant maximum values of the frequency content for both channels. Absolute maximum values of the frequency content for both channels over time. Average maximum values of the frequency content for both channels over time. 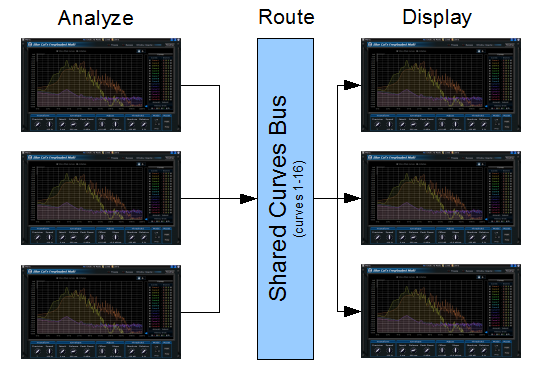 These output curves can be routed to one of the 16 display curves that are shared among plug-in instances. The ids for these curves are shared.curve1 to shared.curve16. 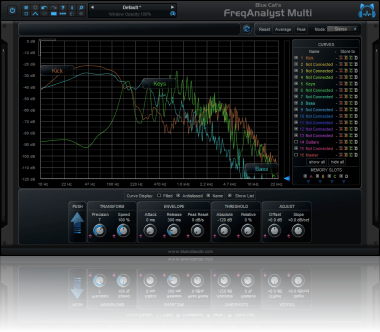 In addition to the controls offered in the main user interface, Blue Cat's FreqAnalyst Multi has various settings that let you fine tune the behavior of the plug-in. 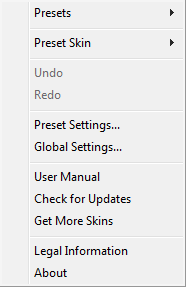 You can choose to change these settings either for the current preset or globally for all instances of the plug-in. This manual only covers the basics of Blue Cat's FreqAnalyst Multi. Our website offers many additional resources for your Blue Cat's FreqAnalyst Multi plug-in and is constantly updated, so keep an eye on it! You will find below a few examples of available resources. 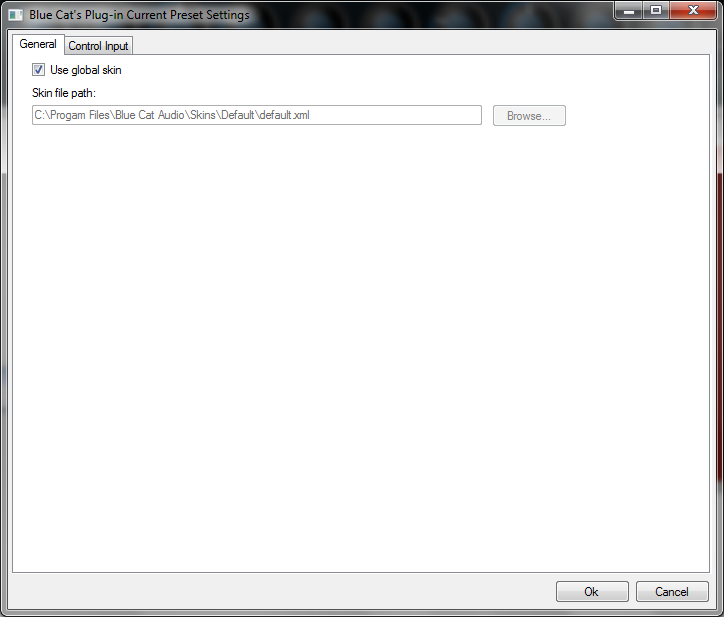 You can find here a list of tutorials related to the Blue Cat's FreqAnalyst Multi plug-in. We encourage our customers to propose their own skins for our products and we often propose alternative skins to let you choose the one that best suits your needs. 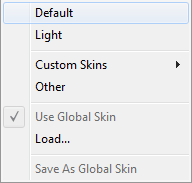 You can check Blue Cat's FreqAnalyst Multi skins page to get the latest skins. As you can see in the history log below, we care about constantly updating our products in order to give you the latest technology available. Please visit our website often to check if Blue Cat's FreqAnalyst Multi has been updated, or subscribe to our Newsletter to be informed of the latest news about our products.